Weighty Matters: Ottawa Catholic School Board's "Freezie Weeks"
Longer term readers may remember my post regarding Ottawa Catholic School Board's St. Andrew's Elementary School's weekly ice-cream sandwich and pizza days. A kind reader of mine with children in grade 1 and 2 at Pope John XXIII Elementary wrote me to let me know about their school's junk food programs. 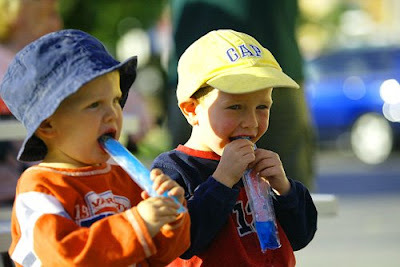 "Jumbo freezies are given out 3 times per week for a 3 week period in order to raise money for the grade 6 class trip. Pizza Days every two weeks with a large donut. Bake sales at school where kids are encouraged to buy as much as they like. Between my two daughters, we attend soccer 4 nights a week where parents feel the need to give out Popsicles at the end of each game. That is four Popsicles a week, plus 3 freezies from school a week, pizza and a donut, a bake sale, sometimes all being consumed in one day! This is way too much sugar, in my opinion, and why is it even necessary?" That's a great question - why is it necessary? If you remember, the last time I complained to the Ottawa Catholic School Board, school superintendent Diane Jackson wrote a rude letter back to me where she claimed not to understand my concerns regarding weekly ice cream sandwich days for 6 year olds. This time I'd like to try something different. This time I'd like to ask my Ottawan readers track down the junk food policies of all of the Ottawa Catholic School Board Elementary schools. With a proper list compiled perhaps the story will gain the legs it takes to leap off the blog and into the papers - and perhaps then we can see change. So here's my request. If you've got a child in an Ottawa Catholic School Board elementary school (or really any school for that matter - let`s see what`s going on out there) please leave a comment (anonymous is fine) below with the name of the school and the junk food promotions that are in place and please circulate this blog post and request to all of your friends with children going to elementary schools in Ottawa.